Let’s say you want to go out for an expensive dinner. But since it is expensive, you want to make an informed decision about where to go. So you pick up a set of magazines that review such restaurants. 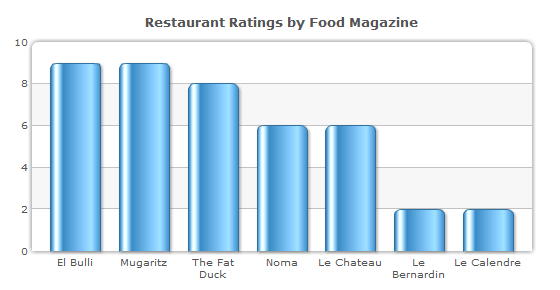 And to help you decide, you plot the ratings in a visual format, say a separate column chart for each magazine. 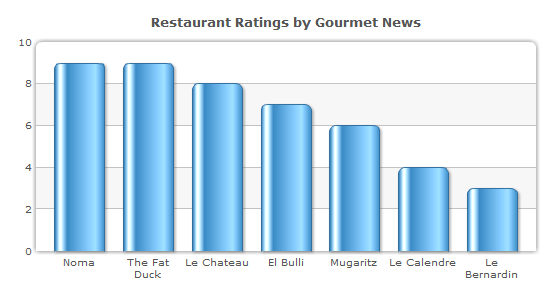 The column charts do a great job of bringing out the highs and the lows in the ratings. 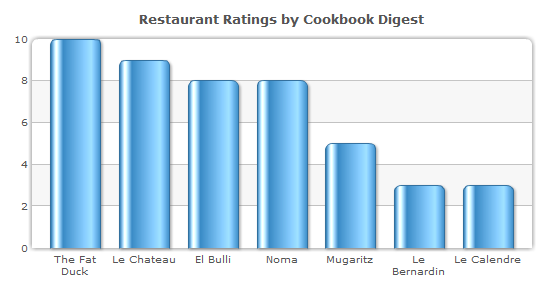 You can easily see that Noma and The Fat Duck come highly recommended by Gourmet News, and Le Benardin is best avoided. 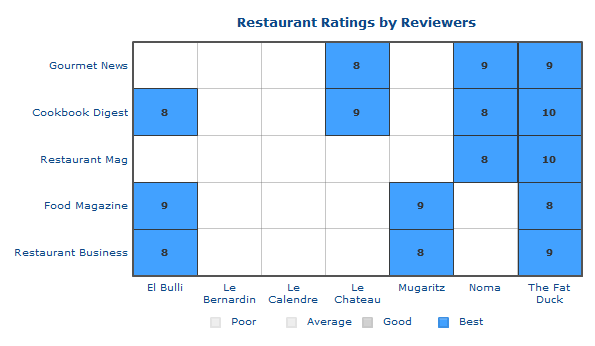 But knowing how subjective these ratings are, which the column charts clearly show, wouldn’t you like to consider all the ratings at once to make your decision? As you can see, the condensed color-coded format of the Heat Map chart makes the data much more easy to understand. 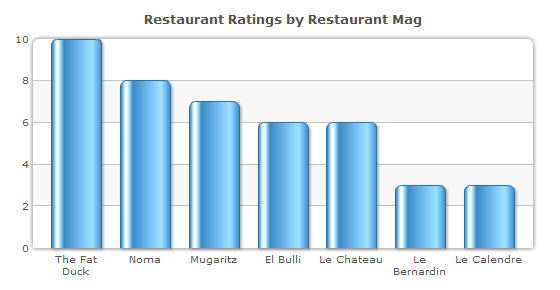 You have your ratings for each restaurant effectively categorized under the Poor, Average, Good and Best ranges. You can also selectively hide or show any range as well. For example, you can see values only in the Best range by “switching off” all other ranges from the legend. Now how about taking it a step further? Rather than having predefined ranges, how about choosing your own range on the chart itself? The gradient legend is a continuous range, instead of being broken into three discrete ranges. This affects the rest of the chart as well since the data sets pick their color from where their value falls in the gradient range instead of one of the three discrete values. You just have to drag the pointers to select whatever range you want. 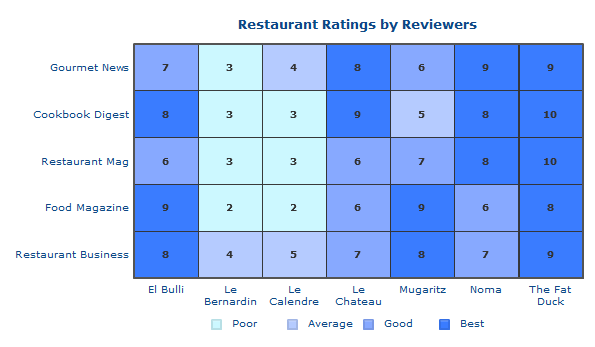 Isn’t it much easier to choose a restaurant using the Heat Map chart? 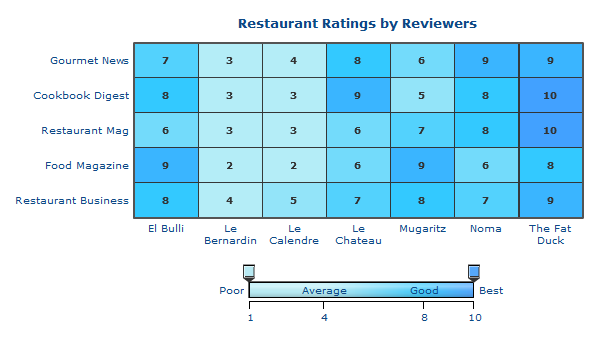 Of course, you wouldn’t be creating a Heat Map chart every time you need to choose a restaurant. So let’s take a look at some of the more business uses of the chart. A heat map chart can be used to visualize complex data like performance comparison of different companies, market response, stock market investments, and lots more. 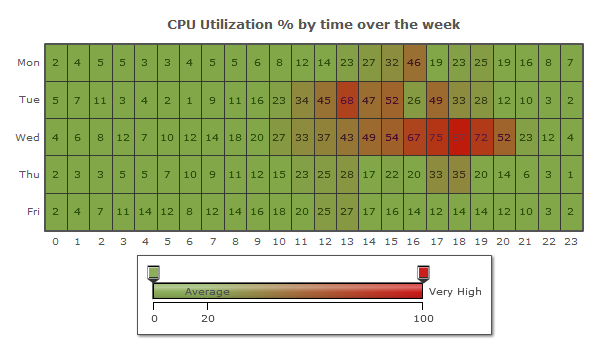 In the chart below, we are visualizing the weekly CPU utilization of 23 computers in a network. Here you can easily know which computers have logged extreme values. If it were not for the heat map chart, the data would have been visualized using separate column or line charts which would’ve been very cumbersome. It is a similar case with a huge marketing data set. From the heat map chart below, you can easily point out the best performing mediums versus the loss-making mediums. 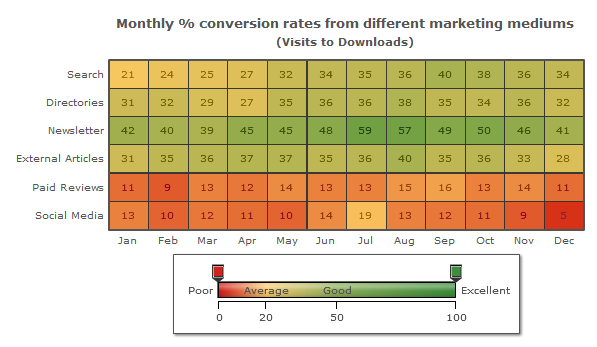 Instantaneous understanding is where the heat map chart scores highly. 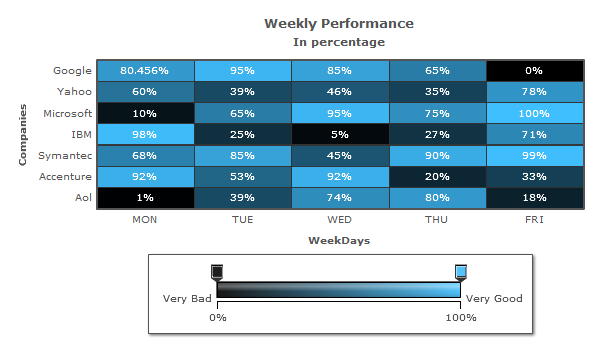 In the Weekly Performance chart below, it is very easy to distinguish the high performers from the laggards because of the color gradations. This was all about the heat map chart. You can use it to visualize large amounts of data, and your analysis will be much quicker because of the color gradations. You can see more examples, read more about the heat map chart and download it from here. Please let me know where i can get such chart.It is vailable with fusion charts.. The sample chart that you linked to is a Tree Map chart. 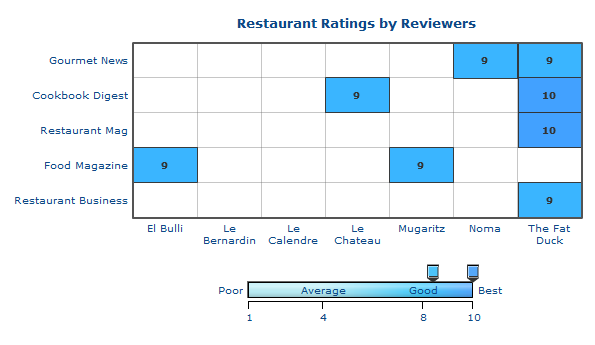 Unfortunately FusionCharts does not have a Tree Map chart in its suite. If there is anything else you require then let us know. Is there a way to place the column names on top of the chart? 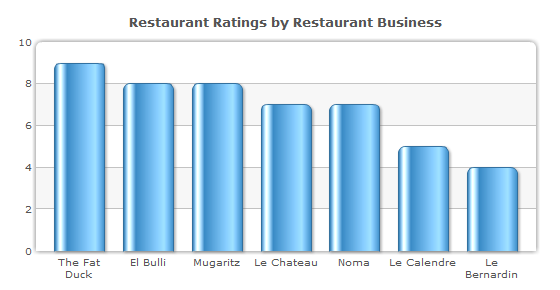 Using “xAxisLabelsOnTop” attribute allows you to display the x-axis labels on top of the chart canvas. I try it, but it doesn’t work! Did I miss something? Can you try using “placeXAxisLabelsOnTop” attribute in the chart element? Yes, using “placeXAxisLabelsOnTop” attribute is right! But why “xAxisLabelsOnTop” cannot realize the function? “placeXAxisLabelsOnTop” has to be used with the latest version of PowerCharts XT. However, if there is a change in the attribute name in our future release, we would update the blog post. This heat Map Chart its free ? can i use directly JSON Or xml code .with any library .. The evaluation version of Heat Map chart is available for free of cost in the PowerCharts XT Download package that comes with an evaluation watermark. You can also purchase the non-watermarked files.